Breathtaking landscapes, rich culture, and culinary delights make Vietnam a country that is not to be missed! Let us show you on this 11-day vacation. Monograms makes it easy for you to venture through Vietnam, because we have taken care of your hotel accommodations, transportation, private guided sightseeing, and daily breakfast. You’ll also have access to a Local Host®, who can provide suggestions about what to see and do during your stay. Your vacation in Vietnam begins when you arrive in Hanoi. Monograms can pick you up at the airport and get you to your hotel effortlessly. Your Local Host will greet you and help familiarize you with the culture and traditions of the city. The next morning, indulge in an included breakfast before heading off on a private guided tour of the city, where you’ll wander the ancient streets of the Old Quarter, visit the Mausoleum, One Pillar Pagoda, Presidential Palace, and Hanoi’s first university, the Temple of Literature. The next day, take a private transfer through the countryside to Ha Long Bay, a breathtaking UNESCO World Heritage Site that is dotted with more than 3,000 limestone islands. Upon your arrival, you will board an overnight cruise that will take you to explore the beaches, caves, and floating villages scattered throughout the bay. You may also choose to enjoy a traditional Vietnamese cooking demonstration while on board. 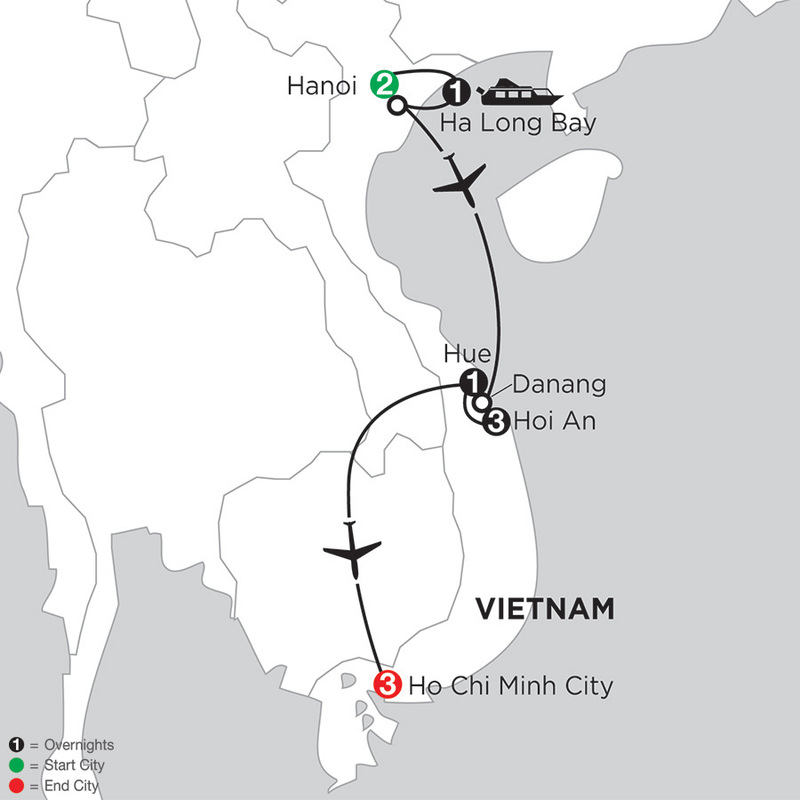 You will disembark the following day to catch a quick flight from Hanoi to Danang, near Hoi An. You’ll have two days to explore Hoi An. The first day, enjoy a private guided tour of the Central Market, where you can buy local goods, from fresh fish and spices to silk; the Hoi An Museum; and a Chinese assembly hall. On your second day, you’ll take a cruise on the Thu Bon River and take a fishing lesson from local fisherman. You will also meet a local farmer to learn about his daily life. On both days, enjoy the afternoon at your leisure to explore further or relax at the beach! Then, you’ll visit the Cham Museum before driving north over Hai Van Pass, considered one of the most scenic spots in Vietnam. You will spend the duration of your day in Hue, where you will visit the Imperial Citadel and the Thien Mu Pagoda. You’ll also get to visit the Tombs of the Nguyen Emperors, and the Royal Tomb of Tu Duc. Finally, you will spend two days in Ho Chi Minh City. Take a private guided walking tour along Dong Khoi Street, where you will see some of the city’s historic landmarks, including Ho Chi Minh Square and the Municipal Theatre. Visit the moving War Remnants Museum and the city’s oldest and largest market, Ben Thanh Market. On your second day, you will visit the Cu Chi Tunnels, more than 120 miles of underground tunnels, formerly used as a hideout for the Viet Cong. There’s plenty of free time in the afternoons to do as you please. You may like to shop for souvenirs or sample pho (noodle soup) or che (local dessert) at one of the many open-air restaurants. Your Local Host can make suggestions and help you make the most of your stay. Make your vacation to Vietnam one to enjoy, not stress about! We handle the hotels, transportation, private guided sightseeing, and activities for you, so that your only worry is which local specialty to try next! At Monograms, we know exploring Vietnam on different modes of transportation makes for a more memorable experience, so we include an overnight cruise on stunning Ha Long Bay. You won’t even have to leave your cabin—we bring the sightseeing to you!